"The North Fork American is the most difficult of the three Forks. Towering Cliffs and 2000 foot canyon walls spotted with black oaks and varying pines sets the back drop of one of the most beautiful California whitewater rafting river canyons. Located near Interstate 80, near the city of Auburn, the North Fork is easily accessible with some camping options nearby. The Colfax-Iowa Hill Bridge to Ponderosa Way Bridge run is the most popular section to run and has been a favorite for California rafters and kayakers since the mid seventies. 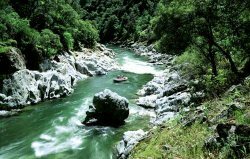 This 9.5 mile run contains many steep drops and boulder slaloms, providing some of the best whitewater rafting of the 3 forks of the American river. "The North Fork American, with no dams upstream, is truly a wild river. It can be run by raft, canoe, or kayak in winter and spring only, when water exceeds about 900 cubic feet per second (cfs). At all levels, the river is Class IV with little rescue access. The North Fork American is a highly technical river. It should only be attempted by very experienced whitewater boaters who have seen its rapids before. A mile-by-mile guide cannot replace the judgment of each individual boater." "The North Fork is as dangerous a river to boat at low flows as at high flows. Several drownings and injuries have occurred at low flows due to underwater sieves. Above about 1500 cfs most dangerous rocks are covered and passages are wider, and maneuvering is much easier. But at flows in the 3,500 to 5,000 cfs range, hydraulic intensity increases markedly and eddies and rescue options decrease." This website has excluded information in regards to the even more difficult, Generation Gap and Giant Gap stretches of river. These sections are upstream of the Colfax-Ponderosa run. The Class V Generation Gap and Giant Gap sections are protected by "Wild and Scenic" status. Difficulty: Class IV-V above Shirttail Canyon (mile 5); Class II below. Gradient: 36 feet per mile overall; 49 feet per mile the first 5 miles; 23 feet per mile the last 4 miles. Runnable Levels: 800 to 5000 cubic feet per second. Difficulty is extreme above and below about 1,500 to 2,500 cfs. Camping: Wilderness camping permits required throughout Auburn State Recreation Area. Visit the North Fork Camping page for more details.